Versatile, innovative, experienced educator in primitive, survival and wilderness living skills. Experienced teacher in hands-on skills and living history and pre-history. Creative, resourceful and able to teach all ages. A ‘people person’. Founder, Director and Instructor for Windsong Primitives. 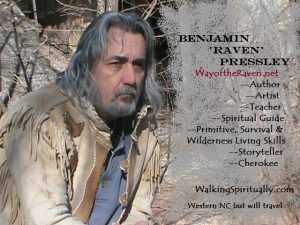 My own privately run school of primitive, survival and wilderness living skills. 1986-2003. Field Editor of Wilderness Way magazine. 1990. Member and instructor in National Association of Therapeutic Wilderness Camps. 1991-1994. Active member and instructor for Backcountry Lifeways, Schiele, Museum, NC. 1986-1994. Instructor doing children’s programs at the Museum of the Waxhaws, Waxhaw, NC. Founder and instructor of Way of the Raven and EARTHTEK School of Survival Skills. 2010-Present. Author. Can You Survive? As well as other books. Mostly I am self taught which doesn’t necessarily mean I taught everything to myself without any help. Primitive, survival and wilderness living skills is something you mostly have to do and most of what you learn is from your research accomplished from educated experimentation. I have learned much from Aboriginal Studies Program, Steve Watts, Schiele Museum of Natural History in Gastonia, NC. I also learned from many other excellent teachers and acquaintances in this field almost too numerous to list. I will gladly furnish more references in this area upon request. Obediah’s Okefenok, Waycross, GA. Billy Brantley\Owner, Tina Rowell\Manager. Museum and historical area. Benjamin did a series of programs on Native American living and built a permanent exhibit of a pre-1750’s Seminole hunting camp complete with ‘chickee’ type shelter. Schiele Museum of Natural History, Gastonia, NC, Steve Watts\Program Specialist. Museum and Backcountry Lifeways Farm (1750-1790 era), Center for Aboriginal Studies (Aboriginal Programs on aboriginal skills worldwide.) Author, Master of primitive skills. Bob Spencer (Eagle’s Brother) Apache friend and elder. Artist. Tom Mancke. Long time friend, student, organizer of Early Technology Week, Hammond School, Columbia, SC. An event for 5-6 grade that I have taught at for over 20 years. James Parker, Huntworthy Productions. Master flintknapper and bowyer. Hawk Hurst. Native American storyteller and musician. Scott Jones. Archaeologist, Author, Master of primitive skills and prehistory.